Drawing on his broad experience in media relations and with newspaper editorial boards, Bill Ray founded WR Communications in 2005. 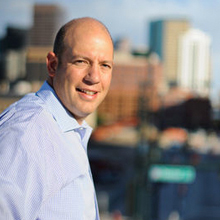 The company began as a one-man PR business and soon evolved into a leading full-service public affairs firm, engaged in many of the highest profile public policy issues in Colorado. WR Communications now operates across the Rocky Mountain West and serves a wide variety of clients ranging from Fortune 500 corporations to rural special districts. WR Communications' approach to public affairs representation is guided by the principle that public policy debates do not happen in a vacuum. Elected officials, community and business leaders, citizens, journalists and interest groups all function as proponents—and sometimes opponents—on issues significant to our communities. Clear, concise and effective communication allows these groups to engage in the debate. Presenting thorough, well-defined positions results in a productive discussion and, ideally, a positive resolution of the issue at hand.